Manit Sriwanichpoom puts the past and the present together, as a reminder to learn from his country’s forgotten history. 6 October, 1976. Right-wing fanatics massacre pro-democracy protesters. The original photograph is by Neal Ulevich, the Associate Press. Lambda print (a digital print on silver halide media), 47.2 x 65.7 inches. Back in 1997, during the month of May, I went to a newly opened hypermarket chain near my studio. In the midst of the crowd, I was quite surprised to notice a family pushing a large shopping cart full of grocery items, which made me wonder, how long would it take for them to consume what they’ve bought? It reminded me of scenes from urban life in various Hollywood movies. It portrayed how Thai lifestyle has changed into pure consumerism. Two months later, a bubble known as the Tom Yum Kung financial crisis was just about to burst. The crisis shocked the world and ended Thailand’s status as an Asian Tiger economy. It was estimated that about one million workers were left jobless by the end of the year. It affected all social classes. Both of these events left a mark on me, leading me to the creation of the Pink Man series. Who is the Pink Man? As a photojournalist covering political affairs, I tried to capture the ‘truth’ as it occurred in front of the camera. However, it was not fulfilling as I realised that there is something beyond the actual scene that the camera could capture. The subjects that I am dealing with are sensitive issues to the Thai authorities and people—subjects such as nation, religion and monarchy. We can’t avoid touching upon these three pillars of the Thai nation when we really want to know the answer to the question: Who are we? 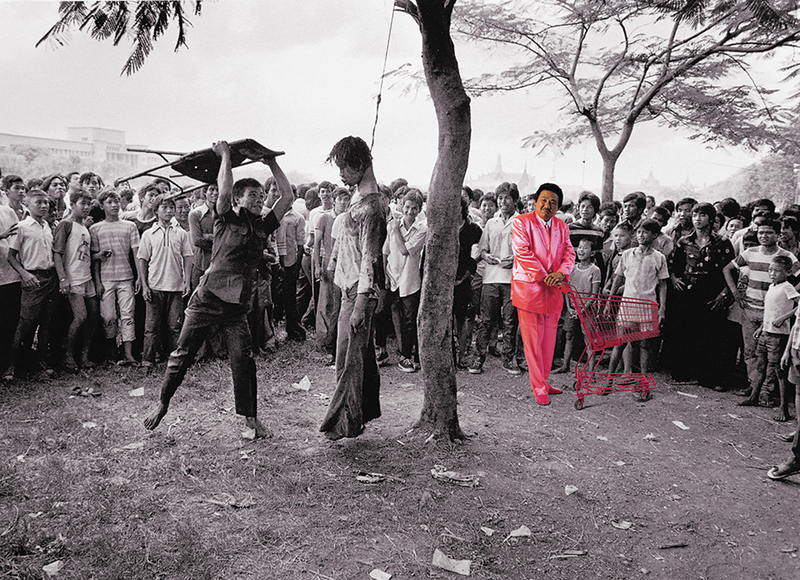 When I began to work on the series, I asked my poet and performance artist friend, Sompong Thawee, to wear a fluorescent pink suit and push a pink supermarket trolley around a business district, as office workers came down to the street for lunch and shopping. The reason why I chose pink was because in the1970s, my friends made fun of people who wore pink, and considered them as those who had as bad fashion sense. If you are a real man, a dark colour is for you, not pink. Instead of using a black or dark blue jacket or suit, like any of the serious CEOs, I turned him into a comedian to be laughed at, with his shocking pink suit. As for why a man? The fact is that world leadership today is still dominated by men in suits. They are hungry for power and start wars everywhere. 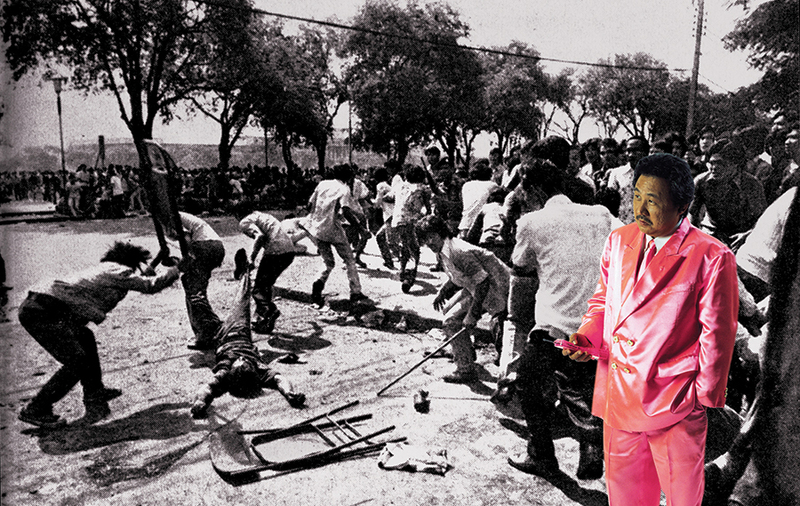 The Pink Man was intended to provoke criticism of the consumerist fever that eventually crashed the country’s economy. It happened in such a devastating way that, along with other oblivious Thai citizens, I myself was not prepared for it, even though I was a journalist. The man in a pink suit became an iconic image born of greed and lies, the mutant personification of consumerism and capitalism, rising like a Godzilla from nuclear devastation. 6 October, 1979. Right-wing fanatics massacre pro-democracy protesters. The photograph is by Kraipit Panvuth. Lambda print, 47.2 x 68.9 inches. Since then, I have worked on numerous socio-political issues, with the Pink Man going to different places. However, one of my most important series was produced in 2001, in response to the result of the Bangkok Governor Election in 2000. 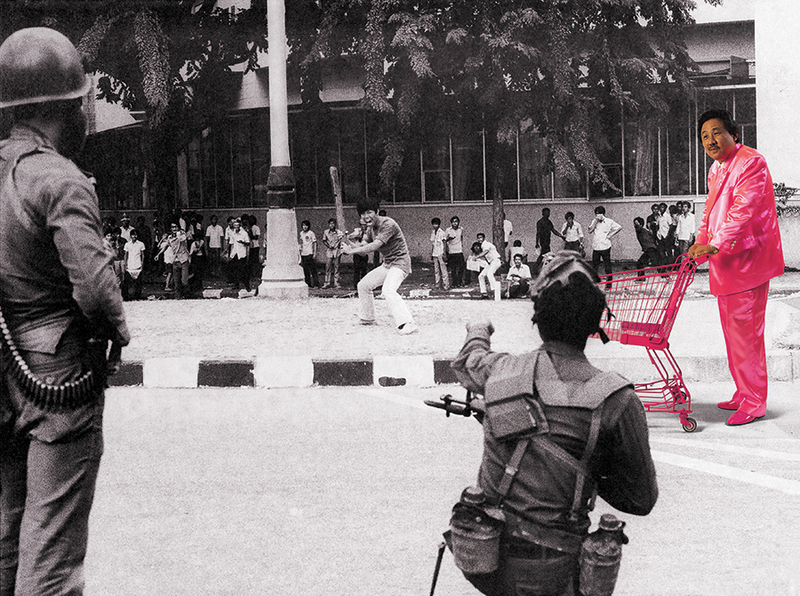 The winner was a right-wing politician, Samak Sundaravej who, in 1976, was the voice on Army Radio, inciting Thai state forces and far-right paramilitaries to kill students protesting for democracy. He was the Thai equivalent of Radio Rwanda (1994). 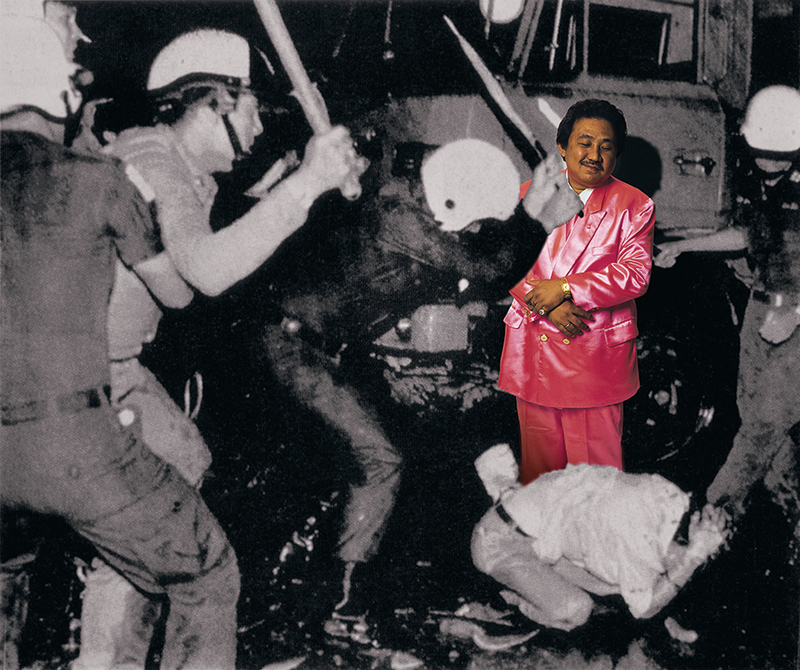 In my other series, the Pink Man was photographed against the backdrop of the actual scenes to surprise the audience. But now, this was the first time, where he traveled back through time, to the historical events of 14 October, 1973, 6 October, 1976, and May 1992. The Thai government has been controlling the narrative of national history, especially ‘democracy’. News photographs of violent incidents from those particular years were not included in school history textbooks. That is why this generation has never seen, remembered, or learned about them. It’s not their fault, but that of our rulers. I intentionally brought back the iconic photographs of each incident, to introduce them to the current generation, to refresh people’s memories. 6 October, 1976. Right-wing fanatics massacre pro-democracy protesters. Photographer currently unkown. Lambda print, 47.2 x 74.8 inches. To achieve this, I got in touch with my friends from the media, and asked them to lend me old archive newspapers and magazines that had published photos from back then. I decided to scan the photographs from these old newspapers and magazines. I preferred them over the original prints of the photographs because the grainy dots prove that these events had happened a long time ago. It was followed by the scanning and the digitising of the Pink Man. With the help of Photoshop, I placed him in the middle of the gruesome scenes. To me, the old news photographs somehow acquired a new meaning and interpretation. It became a contemporary work that creates a new dialogue. In my other series, the Pink Man was not supposed to smile, as he can never be happy or satisfied with what he has. But in Horror in Pink, he smiles with joy, as he sees people killing each other. The pink shopping cart, for me, represents consumerism. With the pink mobile phone, he’s engaging the world through this hi-tech device. This is the self-image of people around the world. It also shows that you are modern and globalised too. 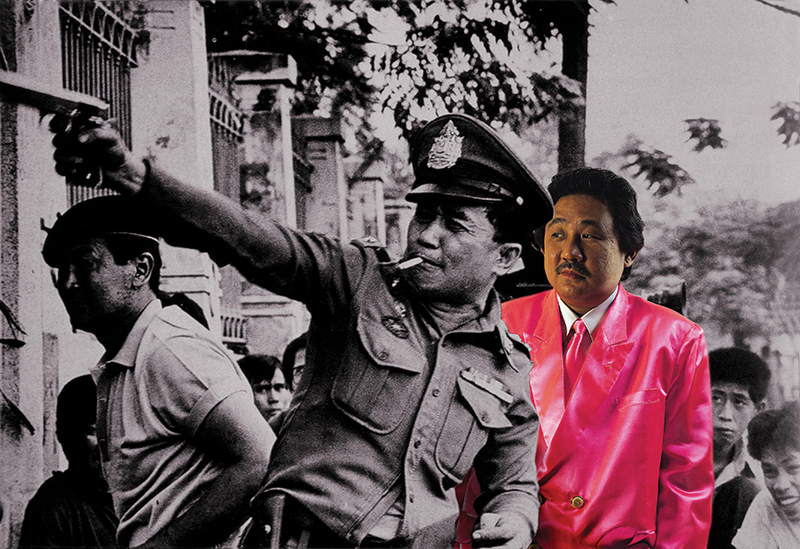 Here, the Pink Man stands for present-day Thailand, a soulless man with no conscience to trouble him. 14 October, 1973. A pro-democracy protest. The photograph is by Plaek Khempila Lambda print, 47.2 x 63 inches. “Buddhism may be the state religion, but it could be said that our true faith is oblivion. In terms of historical perception, most of us are potted plants in a white room, devoid of context, unconnected with our roots. Whole chapters linking us to the past have been blacked out from our consciousness. Whole months’ worth of newspapers from the year 1945 and 1946 are missing from the National Library’s archives. Deliberate sabotage and censorship aside, the Thai propensity to ‘let bygones be bygones’, to preserve the appearance of peace at any price, encourages collective amnesia and therefore ignorance. We do not know our own past; how can we know ourselves? No wonder we’re suffering so grotesquely from an identity crisis. Black May, 1992. Democracy uprising.The photograph is by The Nation’s staff photographer. Lambda print, 47.2 x 56.7 inches. Only one version of history is taught in Thai classrooms. History textbooks are written by politicians, in order to serve their political interests. The very characteristics of so-called ‘Thainess’ are specified by a government body actually named the ‘National Identity Board’. It seems that the aim of every history lesson is not to enlighten, but to brainwash and tame us into a flock of identical sheep, each and every single one obedient and simple-minded, easy to rule. To ensure that we do not raise uncomfortable questions over issues and events that our good shepherds prefer us to forget. As one Italian writer says (and they should know), ‘Without memory, there is no future.’ Not knowing where we have been and how we got here, today we cannot truly fathom where and how we are, and which way to proceed, without falling back down the same old abyss. Without history and memory to be our compass, we are doomed to walk in circles, lost in admiration of the same old absurdities. This darkness clings to us like a curse. We seem destined to repeat the same mistakes forever. 6 October, 1976. Right-wing fanatics massacre pro-democracy protesters. Photographer currently unknown. Lambda print, 74.8 x 47.2 inches. In recent times, the media can still criticise the government, and no one has been arrested for it. Thailand is actually more free than many ‘democratic’ countries that imprison journalists. By saying this, it doesn’t mean that I’m happy with the military government. So far they’re not totally bad, as stereotyped by some in the media. You can criticise or make fun of them, but not of the monarchy. Based in Thailand, Manit Sriwanichpoom has showcased his work at the Asia Pacific Triennial, Photoquai, and the Venice Biennale. 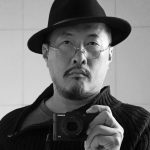 He was bestowed with the Chevalier des Arts et Lettres Order by the French Ministry of Culture, in 2014, and the Higashikawa Overseas Photographer Prize from Japan, in 2017. 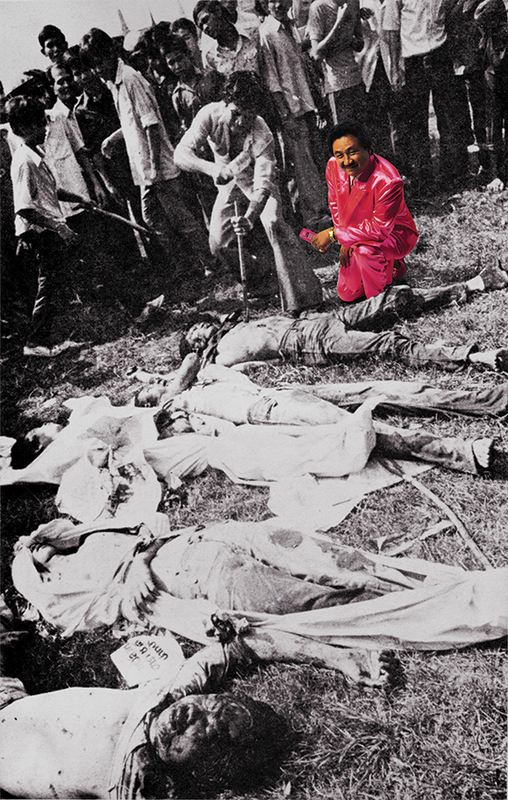 ‘Horror in Pink’ will be exhibited at the Chennai Photo Biennale, from 22 February to 24 March.